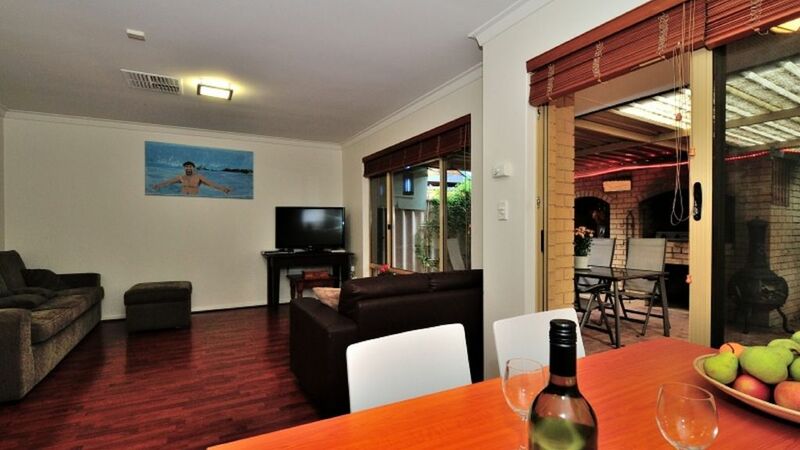 Whisper quiet two bedroom villa is available now for your stay in the Fremantle region of West Australia. With two queen size beds, a charming living area complete with flat screen TV and a private courtyard for your relaxation, you will enjoy every moment of your stay here. Pick grapes straight from the vine in season or watch friendly local blue tongue lizards come to investigate what morsels are available on the patio. The kitchen is fully self contained and laundry facilities are provided for your use. Heating and cooling is via ducted evaporated air conditioning in every room and reverse cycle air conditioning in the lounge room so you will be comfortable in all seasons. Parking is provided for one car in the carport plus a visitors car bay for a second car. A rain water tank has been installed for those of us who enjoy the taste of fresh clean water with no chloride. Three supermarkets (Aldi, Woolworths and IGA) are close by along with other essential shops such as a chemist, liquor outlet, bakery and petrol station. For the children, there is an onsite playground and grassed area. Several minutes drive away is Manning Park, a gorgeous wetland with abundant bird life, bbq and picnic area, a children's playground and fabulous walk track along the coastal ridge. South beach or C Y O'Conner beach are perfect for watching the sun set into the ocean after a cooling dip. With a cycling/walking track meandering along the coast, you can enjoy a leisurely stroll before coffee at a beachside café or keep going to explore the shops of South Fremantle. Book now to secure your stay at Ocean View Villas. TRAVELING DOWN SOUTH AS WELL? TRY BRIDGETOWN IN THE HEART OF THE FRUIT GROWING REGION OF WA AND THE BLACKWOOD RIVER VALLEY. If your journey also includes a trip down south to Bridgetown, we have another property available for your stay there. Accommodating 4 people in 2 queen size beds, Walnut Cottage - Bridgetown is located close to the town centre. Please check the link www.homeaway.com.au/188509 and let me know by email if you would also like to book Walnut Cottage Bridgetown (subject to availability). combination tub/shower, Conveniently located between the 2 bedrooms. Thank you for having us again, you are No1 go to for accommodation in Perth. The improvements made to this property made our stay better than normal. hope to be back again in a month or so. We love staying at this villa and have done a number of times. Conveniant to shops, beach and other attractions. This is a very comfortable well set up safe secure property. It absolutely suited our purpose. Property was neat and very clean. Location was close to shopping centers, freeways and tourist attractions. Plenty of room indoors and great private patio area at rear. Extremely secure with shutters and alarms. Will definitely stay here again. Glad your stay was a pleasant and enjoyable one and that everything was to your satisfaction. I would like to take this opportunity to thank you for leaving everything so clean and tidy. We look forward to you both staying with us again. Stayed for 5 nights at this property and my main concern was air conditioning and internet. The air conditioning was excellent, house was nice and cool. Its 10 minutes away from South Beach. Internet was not working on the first night but the owner came over right away the next day and got it working. If you are a runner, this property is excellent! Just 3 minutes away from the park and you can run to Fremantle or along South Beach. Dont forget the awesome grapes and herbs from the backyard! Check in and check out was a breeze. Glad your stay was to your liking. Yes there are some great parks and open spaces for a jog. The walk trails are also amazing. Thanks for your support and understanding, look forward to seeing you again soon.